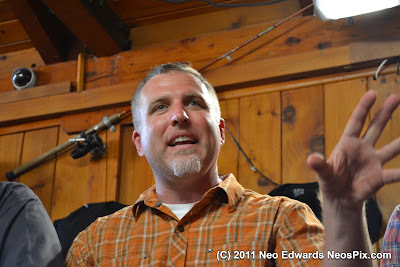 Cliff Barackman, star of Animal Planet's Finding Bigfoot is interviewed by the Bellingham Herald. As always, Cliff is an eloquent ambassador for us bigfooters with his ability to articulate the best of bigfooting to the media. This is no surprise to us that read Cliff's Official Blog. Read the interview below and don't forget to tune in to Finding Bigfoot tonight as the team talks to our favorite Bigfoot researcher advocate personality, Todd Standing. When it comes to Sasquatch, ignore Mitt Romney. Even though the Republican presidential candidate called him a "hoax" in Monday's GOP primary debate in Myrtle Beach, S.C., Bigfoot is big business - or at least the search for him is. The Jan. 1 second season premiere of Animal Planet's "Finding Bigfoot" drew 1.6 million viewers. This the second-best premiere for the network and a healthy number for a New Year's Day opening, and the ratings for the following two episodes have remained respectable. Produced by Ping Pong Productions (the same company behind Syfy's monster-hunting series "Destination Truth"), the Sunday night show follows the Bigfoot Field Researcher's Organization (BFRO) as it chases down leads, examines supposed evidence and attempts to track down the most famous cryptid. "Finding Bigfoot" stars educator Cliff Barackman along with BFRO founder Matt Moneymaker, research biologist Ranae Holland, commercial fisherman James "Bobo" - and a possible cameo each week by the mythical beast. Barackman isn't an eccentric monster-hunter type. Originally from Long Beach, Calif., he has taught fourth, fifth and sixth graders. He's also a jazz guitarist and teaches lessons, but has always maintained a passion for science. He says his interest in Bigfoot came more from pop culture than from science, and that he grew up loving monster movies. It wasn't until he saw documentary shows like "In Search Of" in the 1970s that he became excited about the possibility of a "real" monster in the woods. He says it hooked him "pretty deep," and when he was in college he would spend time between classes reading up on the Sasquatch. The research led to Barackman thinking of Bigfoot as not just "fun and quirky and weird," but also as real and believable. Barackman recently discussed the show, his own experiences and how his work might also mean the downfall of the beast he's pursuing. QUESTION: What was your most compelling experience? ANSWER: I've heard them very close to me on many occasions. I've had very large rocks thrown very close to me to get my attention - like, head-sized rocks. I've heard splashing in the river very close to get my attention. I've had them 40, 50 feet from me, screaming in the dark, waking me up at three in the morning. I've found footprints before. I've found trees snapped. I've found hair samples. I have numerous vocalizations on my website ... although I have yet to physically lay my eyes on them. Unless that thing I saw in North Carolina that Matt swears was a person (in Season One) was a Bigfoot. And I'm kind of inclined to think it was Bigfoot instead of a person. Q: What do you do when you're out in the woods and you encounter this thing? What happens next? A: Bigfooting is not a situation for the mind-state of most hunters with their super awesome guns, wearing camouflage and all that other stuff. Because that kind of person, that kind of mentality, is the kind of mentality that tries to gain control. And when you are with Sasquatches, in the woods, you are not in control. These things are super ninjas. That's the best analogy I have. They can literally be 50 feet from you and you won't even know. ...When they're around and they come in close, they stand off in the woods, 50 yards or so and watch you. And if there's more than one around, maybe they're going to knock into each other or clap or whatever they're doing to make that popping noise that they do. You can hear them. So I think the best you can do is sit tight, look interesting, maybe talk to them, maybe throw some food out into the woods. And try to record them with a digital/audio recorder. Or if you have a thermal imager, try to catch a glimpse of one in between trees as it darts around. A: No, of course not. How do you capture an 1,100-pound primate with hands that's as smart as you are? You just don't do that. I think, as far as Bigfooting goes, everyone has their own personal goal ... my personal goal is to learn about them as much as possible. Because when discovery does happen, like I said, it's going to be pretty bad for them. People are going to go out to the woods. Fools are going to go out and try to hunt them. My personal goal is to soften the blow of discovery by learning as much about them as I can now, and then hopefully use this platform that I've been given by Animal Planet to educate the public. A: Absolutely, but at the same time, if the opportunity is given to me and I refuse it because it's going to be bad for them, it's going to be given to somebody else. I feel that my heart is in the right place. I'm actually interested in Sasquatches whereas other people - known hoaxes and charlatans that are out there - they are just doing it to further themselves and earn money and fame and all that other junk. I'm a professional educator. I look at this as an educational opportunity. Q: What is the timeline to discovery and when will the really solid proof emerge that Bigfoot exists? A: I think there's going to be a rising tide of acceptance where more and more academics step forward and start studying this thing until eventually some cold-hearted person would go out and shoot one of these things - or a trucker will just run one down on a freeway somewhere and we'd just have a body. ... It's really only a matter of time until that happens. I know that's a long answer but I don't think it's going to be two years from now. I think there's going to be a rising tide in acceptance. Until somehow or another, a dead one is brought in. Q: What are your thoughts on other cryptids like the Jersey Devil, the Loch Ness Monster, Chupacabra? A: I think the Jersey Devil is just another local name for Sasquatch way back when. I know they're reported to have hooves and wings and all this other stuff, but that probably came out later. Most likely back in the early Colonial days, there was a long oral history of the Jersey Devil. Practically all the settlers, whether we're talking 1690 or 1890, they were all Christians, right? So, as they moved into unknown areas, they ran across scary things that howled at them - or most likely they didn't even see them, by the way, because there's a lot of places with reportedly hauntings in the woods, but those hauntings are limited to rocks being thrown and scary noises, screams and howls. Those are all Bigfoot things. ... As far as other species of cryptids, it was through bigfooting that I came to realize that giant river serpents are probably the real deal. I did an episode of "Monster Quest" years ago where "Bobo" and I were the first white people basically to ever go bigfooting on the Yurok reservation in Northern California on the Klamath River. Just by talking to a handful of Native Americans on that trip alone, I came across like three or four eyewitnesses to these giant river serpents that come up in the river chasing salmon, or used to when there were lots of salmon in the rivers. Q: Stories of these creatures often revolve around people hiking in the woods, but what about when campers are more vulnerable, like when they use the bathroom in the woods? A: You'd be surprised how many of those stories I've heard. Now you picture someone who does go out to take a leak or take a dump around a campfire. They leave the campfire area and go 50 yards out somewhere. They're exactly in the right position, so to speak - squatting - to see a Sasquatch because Sasquatches come close to fires and watch campers. A lot - a lot being like 1 or 2 percent of the time you're out there. Now, these people are away from the fire and squatting, which in primate body language, squatting is a very inoffensive pose. In fact, mountain gorilla specialists, they say when you get close to mountain gorillas, squat down and don't make eye contact. This is exactly what these people are doing when they're out in the woods taking a dump or when a woman is taking a leak. They do see Sasquatches a lot. Aaron Sagers writes about all things pop-culture each week, but you can follow him daily on Twitter under AaronSagers and on his site, www.paranormalpopculture.com. He can be contacted at sagers.aaron@gmail.com.